It was bossy of us, yes. But we wanted to create a space for vulnerability. We never used that word. We said: it’s too easy to sit back and critique. We wanted conversations outside the comfort-zone. We’re not ones for small talk, and there is, perhaps, too much emphasis on individual comfort. We never used that phrase. We said: if everyone is required to share, then everyone must risk something. Those probably weren’t our exact words. In any case, designating equal time for each attendee is a democratic gesture. The artifice of the structure gave permission and pushed the conversation in unexpected directions. There was writing, and other art. Visual. Voice. Photography. Film. It didn’t have to be something you made. Rather, to bring something you were thinking about. The invitations included examples. One said: Hope, hand-raised and fed from a tube; a crossword puzzle made of tweed; a bunny hop of precise duration; a poem about a poem about a boy. Here is another: Clay, creative writing, colors on a piece of paper, cozies (tea), charcoal drawing of Clay (the teacher’s son, Clayton for long), a choreographed dance routine. Another for good measure: Mistakes, matchbox dioramas, muscled dances, motor car poems, mad-cap photos, more. One time, someone brought pale brown clay and directions for shaping it into a rabbit. This delighted some and upset others. Sometimes there were 6 women, sometimes 8, sometimes 18. And so the 5 minutes stretched and contracted, yes, and afterwards: more eating. More drinking. Plus the third aesthetic experience, that’s how we named it. We reassembled our circle and talked about what happened during the sharing. That’s what we called it. Not performances. We talked about common themes and juxtapositions. Similarities and dissimilarities. Complaints and conceits. What were we trying to figure out? It is best to begin with a friend. A very special friend, another person, in any case, will make the going more probable. The we in this case was Vanessa Place and Teresa Carmody. Plus Mrs. Porter, a character in T.S. Eliot’s The Waste Land. From the salon’s inception, Johanna Blakley began researching Mrs. Porter and discovered a real-life madam in Cairo during World War I. It is best to invite smart friends. For the first three to four years, the salon met at Carmody and Place’s apartment in Little Ethiopia. The women met on the first or was it the second Saturday of the month. There were paper invitations, a collage made from putting objects on the copy machine and pressing the button. It is always best to press the button and to have the button pressed. Do you remember the salon in Lund, Sweden when Marianne read Axel’s short story? And in Albany at Susanne Dyckman’s house, that was the year the bees began to disappear. At the Richard Hugo House in Seattle, and later, at AWP in Atlanta? When Carmody and Place moved to West Adams, so did Mrs. Porter. There, eventually, she opened a gmail account and Coco Owen began organizing the invitations, digitally. That was either after or during the year the salon was hosted by other women. Johanna Blakley. Brenda Varda. Katrin Jurati. Andrea Lambert and Katie Jacobson. Barbara Maloutas. It is best to move around, to mix things up. Better yet to hand over some hostess duties, especially if you are overwhelmed and need rest. By that point, the salon was very much part of Les Figues Press, part of its mission. And then the rules changed, this happened much later, this history skips so much. It is best to allow a certain give and take, it is best to begin having a special guest. Plus, participation became optional. In the first half of the evening, those who wanted to share could share for 5 minutes or less. Those who wanted to listen or look could simply look or listen. In the second half, the special guest presented something special. A meditation. A dream analysis. A new project. A portrait of Mrs. Porter, her new twitter account. 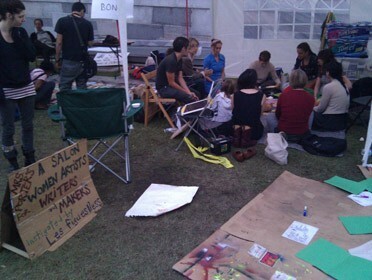 Do you remember the salon at Occupy LA, putting poems in people’s tents during the general assembly? Do you remember lying on the floor in a trance of voice and breath? Did you mail your kitten postcard? To whom? Who came? Laida came. Larkin came. Lisa came. Thea came. Adrienne came. Margaret came. Christine came and Susan made us whistle. Johanna D and Johanna B, Elena R and Elena B. Many Mary’s, several Anna’s. Sissy came. Geneva came. Amanda and Miranda came. Connie came, she asked a question. Maureen came. And Tanya came. Cherine came. And Tracy came. Jessica came. Rebecca came. Amy plus Allison came. Maybe the baby came, but definitely Erin came. And Danielle came. Linda came. Molly came. Tanya came. Here she came and came again: Jemima. Elizabeth. Amina. Coco. Kate. Ceres. Sharon. Camille. Nikki. Barbara. Amy. Jen. Jen. Andrea. Andrea. Susan. Susan. Susanne. Eleni. Karen. Gina. Heather. Pamela. Pam. Julia. Rachael. Sarah. Olive. Nancy. Audrey. Janice. Jamie. Jane. Stacey. Alta. Elline. Dorna. Diane. Margie. Quintan. Laura. Erin. Barbara. Barbara. Katie. Hillary. Sylvia. Svetlana. Dorit. Leslie. Katrin. Bonnie. Renee. Griselda. Deborah. Deborah. Terry. Emma. K. Daniel. Mat. This list is incomplete and given without permission. A peek into the parlor. The preferred mode now is potluck. Because they wanted to write. Because they wanted to talk to writers. Because they weren’t in school anymore. Because they were too tired after the long commute. Because their days were filled with children. Because they wanted to meet the special guest. Because they were finally writing again. Because they wanted to screen a new short film. Because they were writing new poems. Because they loved women. Because they were worried about not writing. Because they were looking for a job. Because they were interested in collaboration. Because they didn’t want a workshop. Because they hoped to be published. Because they were invited. Because they wanted more information. Because they were feminist. Because they had just graduated. Because they were rarely asked about their creative work. Because they wanted to experiment with performance. Because the conversation thrilled them. Because they were supporting their friends. Because they didn’t want to go alone. Because they wanted to meet new women. Because they were writing again, finally. Because they wanted a night away. Because they had a deadline and something to say. Because they wanted to listen to others. Because they suspected something might happen. Because they are artists and writers. Because they make things and a salon is something too.